I’ve written a couple of posts exploring the tension individuals and organizations experience as they balance wanting/needing to innovate, with the tendency to, well, not. We looked at some factors that support this ‘laziness’ - both at the individual and organizational level. I’ve also shared some of the recent research from the burgeoning field of ‘social physics’. In today’s thrilling installment, I’ll rationalize how these two sets of observations sit together, and do they fit together I hear you burble? Well, yes, they do (I think). 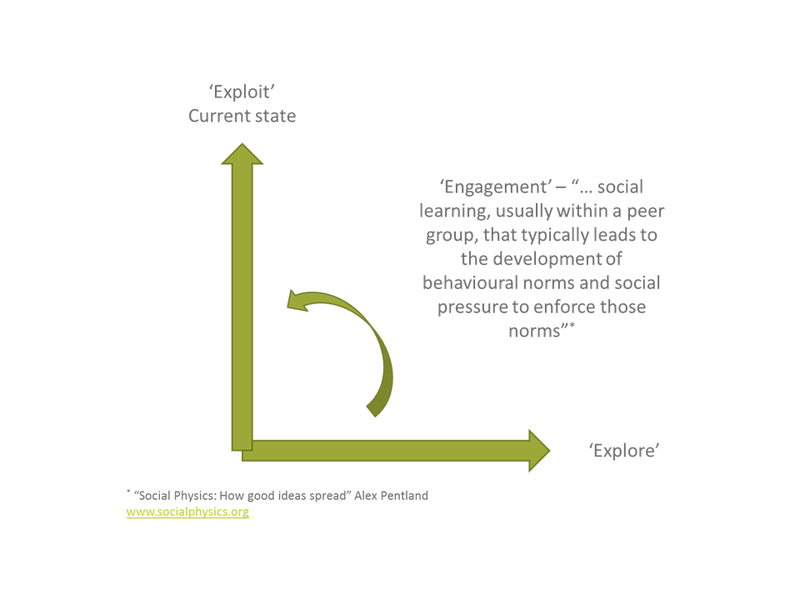 Turns out that engagement (as defined by the social physics ‘gang’) could be rationalised as the process through which an organization or individual is able to redistribute its energy from the ‘explore’ dimension (inclusive of the desired pattern of new behaviours), and use it to change their current state of behaviours (their pattern of exploitation, if you will). I’ve tried to draw this below. This takes place through social learning and the accommodation of alternate patterns of being. Without this, one imagines the adoption of new behaviours becomes unsustainable; the context you are changing within won’t tolerate your shenanigans and you’ll be unable to realise your new mode of being. This insight has plenty of implications in lots of different fields, and something I’m sure we’ll elaborate on in future posts. What’s this all got to do with Lunch Roulette, I hear you grunt? That dear reader I’ll leave for another post.